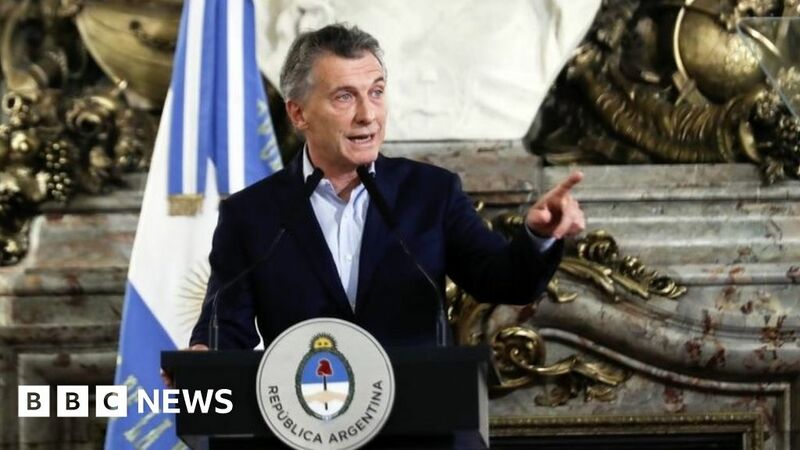 Argentine President Mauricio Macri has announced government job cuts aimed at reducing the deficit and attacking a patronage system in place for decades. Ministers will be forbidden from employing close family, and those currently in posts will have to leave. One in four positions appointed by ministers will also be cut and government employees will not receive pay rises this year. The government expects to save $77m a year with the cuts. Mr Macri who has just returned from meeting other world leaders at the World Economic Forum in Davos, Switzerland, said the government could not be excluded from his austerity drive. “Change is serious. What we have proposed is much more than economic change, it’s cultural change,” he said. Within hours of his announcement, several close relatives of ministers had left their jobs. The new order focuses on national government and does not appear to include local and state levels. On a long list of those expected to leave are the labour minister’s wife and two sisters, and the interior minister’s wife and father. There have been years of complaints in the press and in congress over nepotism in government. Last year two bills were introduced by congressmen attempting to address the issue and aimed at targeting biased treatment and hiring practices in government. Analysts say President Macri himself may also be trying to deflect criticism for putting his own allies and supporters in government roles after having for years accused former president Cristina Fernández de Kirchner’s administration of corruption and cronyism. Coming from one of the richest families in Argentina, he is often in the spotlight when a government decision benefits his companies. President Macri is seeking re-election next year. He has promised to press ahead with unpopular austerity programmes as part of market reforms.